Posted on March 28, 2017 at 1:56 pm. Five thousand Portlanders have seen "Hands Up" in the past year. Is it possible you missed Hands Up in 2016? If so, you missed a powerful and relevant production and post show conversations that moved Portland’s discussions about diversity to a whole new level. 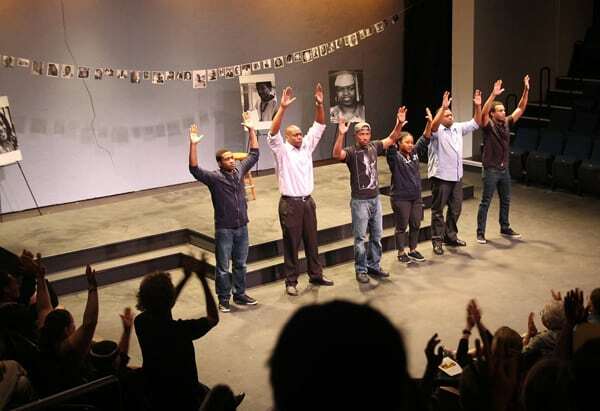 Five thousand Portlanders, both traditional and non-traditional theatre-goers, saw Hands Up in theatres, community centers, schools and colleges. 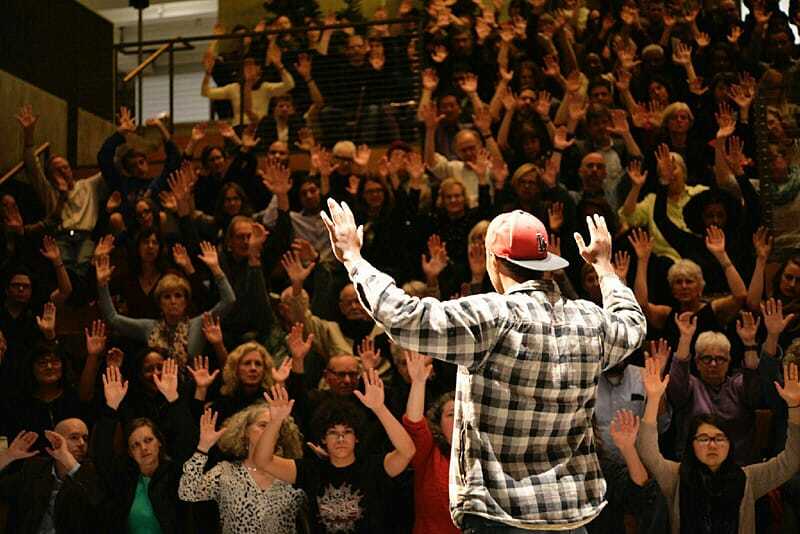 Hands Up is a presentation of the August Wilson Red Door Project, whose mission is to change the racial ecology of Portland through the arts. 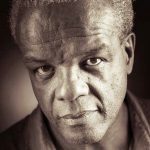 Directed by Kevin Jones, CEO and Founder of the Red Door, and a critically acclaimed actor and director, Hands Up is a set of seven monologues originally commissioned by The New Black Fest in New York City. 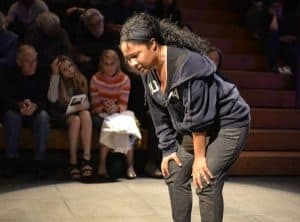 The curator at New Black Fest asked seven accomplished playwrights: “What do the police shootings of Mike Brown in Ferguson, Missouri, John Crawford III in Beavercreek, Ohio, and others bring up for you?” The result is seven autobiographical monologues crafted together to take the audience on a provocative journey of self-discovery. When Hands Up first opened, it played to about 50 people, but it didn’t take long before audiences reached 300. Those audiences were diverse in terms of race, ethnicity, age and class — an uncommon mix for Portland and a demonstration of changing the social ecology by “mixing it up” for shared experiences. The philanthropic community responded to the success and potential of Hands Up and the model that keeps performances at no cost to individual audience members. RACC, Multnomah County, The Collins Foundation, Meyer Memorial Trust, Oregon Community Foundation and the James F. and Marion L. Miller Foundation all have contributed to Hands Up. Then the lights go out, and an actor stands on the stage (sometimes a formal theatre; other times, a community venue) and tells you some truth. The audience sits in the dark, and through the rite that still gives theatre much of its potency, a community emerges with a common purpose: to listen, to learn, to feel. For the next ninety minutes, the audience witnesses stories that are deeply personal, deeply painful, and told directly and intimately. There’s a good chance that white audience members have never heard these stories first hand. The truth is that most white people don’t know how to make friends with people who are different from them. There are so many barriers: Fear of hurting feelings. Not knowing what is “correct.” Too busy managing everyday life to put in the time and effort at what seems like a monumental task. Afraid of acknowledging conscious and unconscious biases, a sense of superiority, a fear of the other, of being uncomfortable, of not being the good white person in the room. People of color in the audience, especially black people, have an opportunity to reflect, to hear the invitation to heal, to embrace the parts of themselves that have been neglected because they’re focused on fighting off the external forces that are causing the trauma, and trying to understand the effect of that trauma over the course of a lifetime. Black people also might be wondering how all this truth is going to shake out. Do white people really know what goes on? And if they’re finding all this out now, what’s it going to be like when the lights come up? Was it a good idea to come to this play after all? All this is understandable and natural in our segregated city, even as it needs to change. But the power of Hands Up is that even as these thoughts, concerns and fears race through minds, the stories on the stage draw the audience in, and when the lights come up, all have survived: The black actors who once again risked all that pain to tell the truth; the people of color in the audience who have seen themselves reflected in their full humanity and have felt a collective breath of empathy coming from their fellow audience members; and the white folks who feel vulnerable and realize that this new vulnerability didn’t kill them after all. Letting in another human being with another story, a different story from their own, doesn’t detract from character or status. Empathy for another person doesn’t make us less than we are. Friendly House on May 13 at 2:00 p.m. and 7:30 p.m.
Wieden & Kennedy on May 27 at 7:30 p.m. and May 28 at 2:00 p.m. There is no cost for these performances, but reservations are required and can be made as of April 15th at boxoffice@reddoorproject.org. For more information: reddoorproject.org/handsup.